Lewisville Dam is well past its design life and in need of repairs. We all need to plan accordingly. Below are a few quotes worth noting! Like a tsunami, the wave would submerge downtown Dallas in roughly 50 feet of water, the Corps estimates, causing more than $21 billion in property damage, before continuing south down the Trinity River toward the Gulf of Mexico. 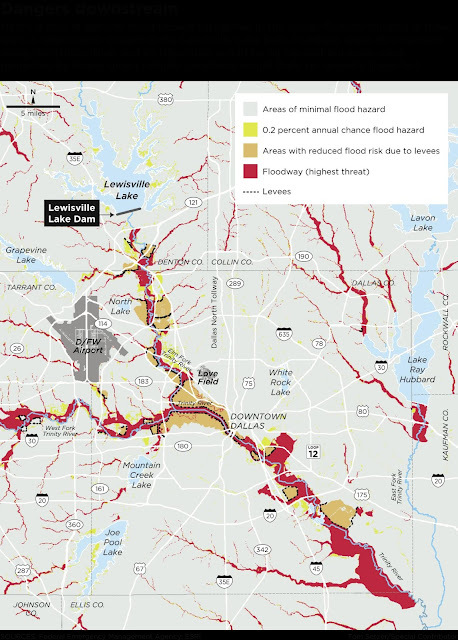 The Corps has prepared maps of the inundation area and casualty estimates but won’t release them to the public on orders from the U.S. Department of Homeland Security. The Corps also will not release a list of its top 10 high-hazard dams in the country because it might "open the public to security risks from those that could use the information to do harm," according to a spokesman. 431,000 in harm’s way the dam posed a “very high risk” to the population centers downstream from the dam. That is, Lewisville, Coppell, Carrollton, Farmers Branch, Irving, Las Colinas, Dallas and points south.